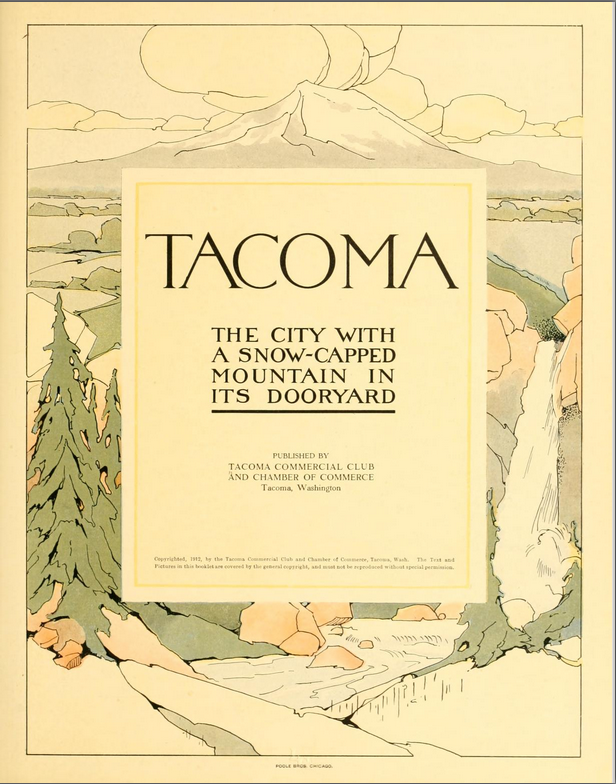 HOME OF THE TACOMA COUNTRY AND GOLF CLUB.- On page 27 will be found three views taken on the immense gravelly prairie and fresh water lake district beginning at the southerly limits of Tacoma and extending south the length of two ordinary counties. 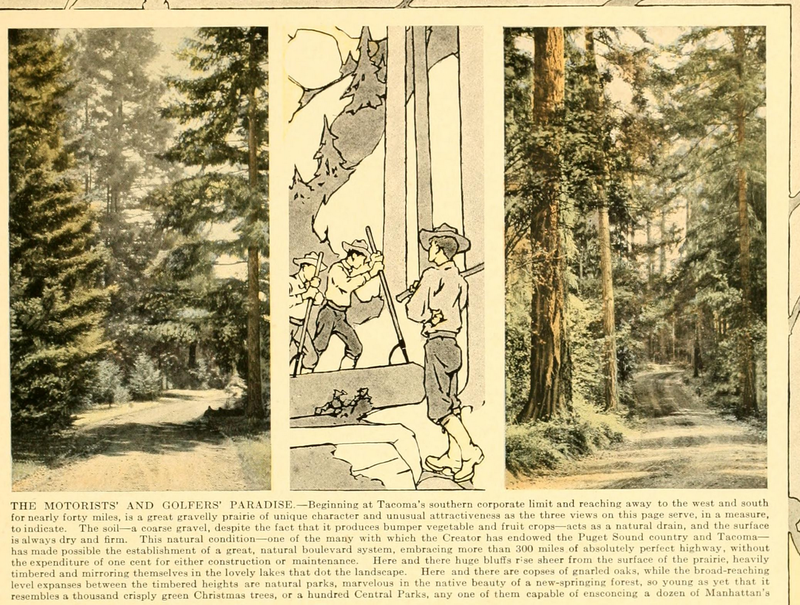 These views were taken in the vicinity of the splendid clubhouse of the Tacoma Country and Golf Club above illustrated, and serve to indicate, as best pictures may indicate, the interest-impelling character of the clubhouse environments. Nowhere in the East, even in the immediate vicinity of New York or Philadelphia or Boston, will be found a country club development superior to that of the Tacoma Country and Golf Club, and this development in contra-distinction to that near the eastern cities, is possible of almost limitless extension. The Puget Sound climate is, of course, a large determining factor to this development, for it allows the pounding of gold balls or the chasing of the annis bag from January to December. Indeed, when the gentle rains of late autumn begin, more knickerbocker-clad enthusiasts will be seen pursuing their seemingly endless course over the links than in the sunniest days to be conjured, for no rain falls during June, July and August, yet it is never more than comfortably warm. Golf and riding to hounds are all-the-year-around institutions in Tacoma's country club life, and visitors are always loathe to leave after once tasting the pleasures abound. The clubhouse above is the center of but one of the developments on this prairie and along the lakes that dot its surface. So when I first read this, I immediately flipped to page 27 to see the views of the immense gravelly prairie. Below are the images from page 27. You see two images of towering firs and then the larger third image is of a nice prairie dotted with young firs. That somewhat accurately depicts the property today although the firs that once dotted the prairie are now much larger and unfortunately many other firs have been planted over the years making it not much like a prairie at all. Still the same, you can go to the edge of the property near American Lake and see huge, old towering firs as in the images below, while certainly the golf course interior is much more open like that third image since the trees are younger and smaller. 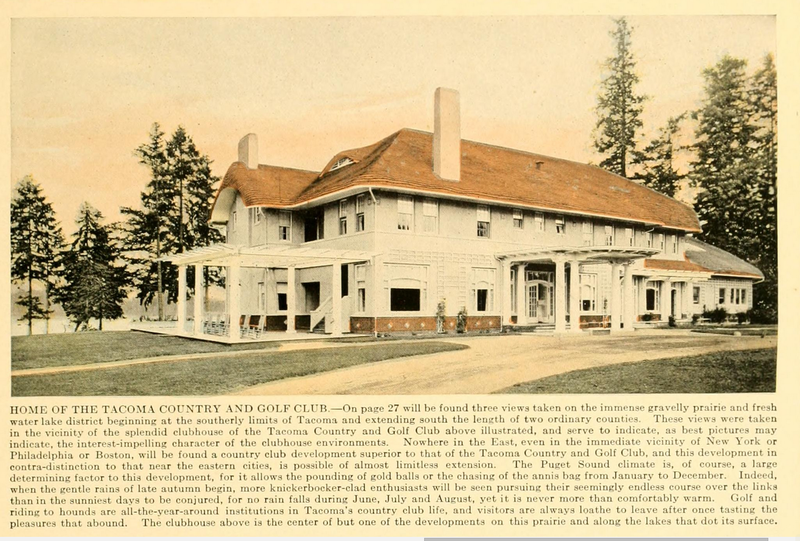 Anyway, as you continue reading the caption, clearly the author felt very highly of the Club development at the time and that's not too surprising since in 1912, golf was still young in the states and Tacoma C&GC had already cemented itself as the first Club in the west and clearly one of the best with it's glorious, new, lavish clubhouse. I love the next statement in the caption that touts the great weather in Puget Sound. The text says "pounding of gold balls and chasing the annis bag from January to December" ,but obviously there is a couple of typos there. It should read of course "pounding of golf balls and chasing the anise bag from January to December". I'm not sure a lot of people would say we have the best weather here but again you have to look at what the game of golf looked like in 1912 when this was written. Most of the great clubs at the time were in New York, Philly, or Chicago and those areas have a definite off-season during the winter months. On top of that, people during that period didn't necessarily feel that sunny, warm weather was good for golfing. In fact, during the hot summer months, people took time off from golfing since the turf wasn't very good and appropriate golf attire was a coat and tie for the gentlemen and a full length dress for ladies. The turf wasn't very good since irrigation systems really hadn't been invented yet and we know the first irrigation system at Tacoma didn't come until 1923. But anyway, you get the point that the Puget Sound climate is so mild that golf can be played all year and of course if your a golf enthusiast, this makes it an ideal region to develop a golf club. Combine good weather with good property and you get something very special like Tacoma Country and Golf Club. As the last sentence of the caption reiterates, the property at that time was an endless, open prairie. Links type land was considered ideal for golf during this period and the prairies of south Puget Sound looked strikingly similar to links land. But now here is the tragedy in our story of the Club's history. The prairie is virtually gone. Check out the following diagrams which show the distribution of prairie land in the 1850s versus the 1950s. 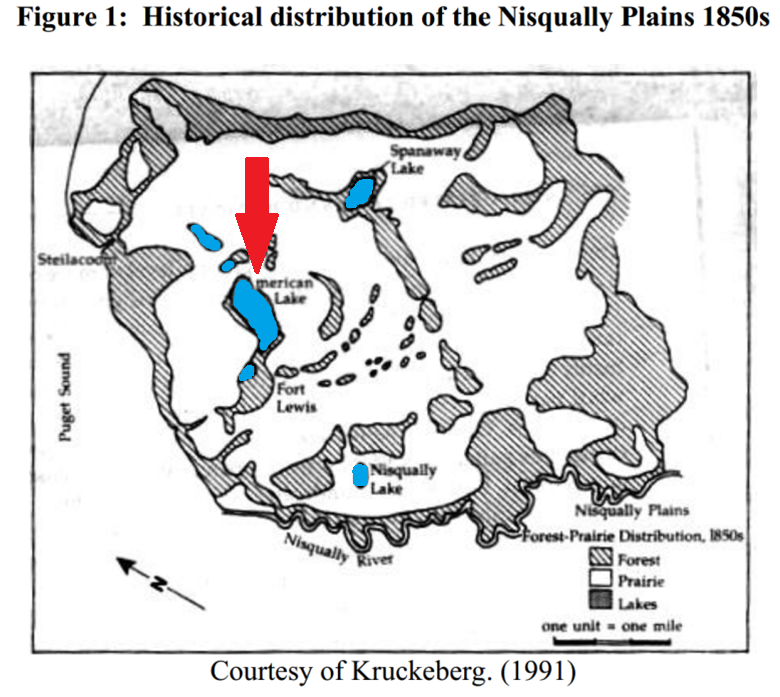 The red arrow is pointing to where Tacoma C&GC is located, the white areas are prairie, and the shaded areas are forest. 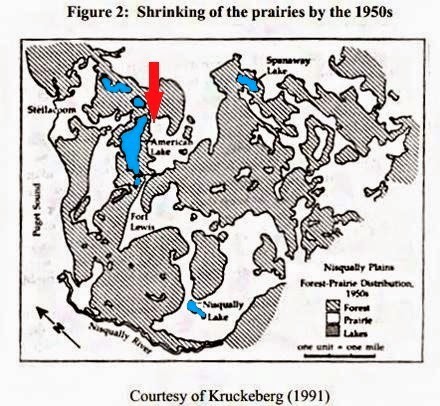 Now look at the same area in the diagram below which shows the distribution of prairie in the 1950s. Look at where the red arrow is pointing which again is the Club's location. You can see that it is still very much prairie but the forest is creeping in from the lakes and from the east. 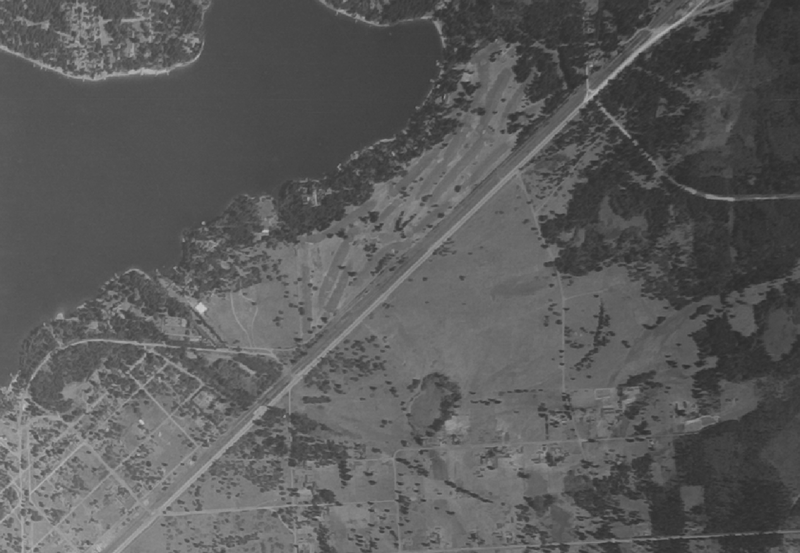 Now look below at an aerial of the course in 1941 and sure enough, the course is still on an open prairie. 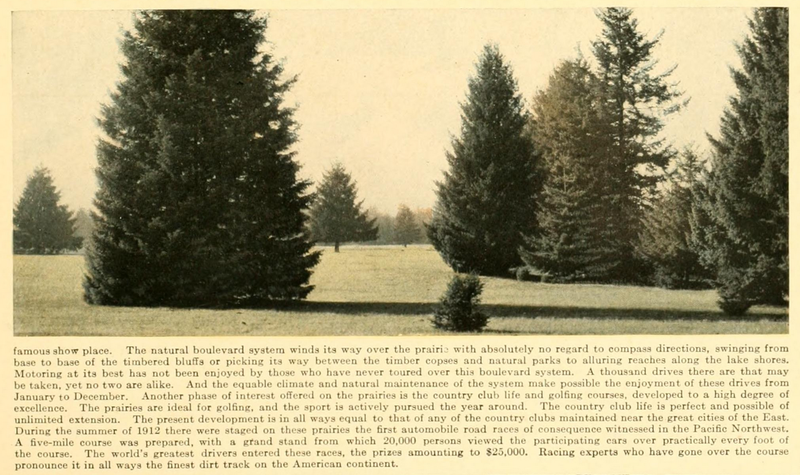 So you see it really isn't until recently in the last 50 years that Tacoma's course became tree lined with big fir trees. For most of the Club's history, the course has been an open site that allowed for good turf and favorable land for the Garry Oak. Unfortunately, the invasive Douglas Fir has been allowed to encroach on the site, and even more disturbing, the Club has actually planted Douglas Fir which has increased the speed of prairie loss. I myself have planted firs on the course so I am also to blame for this tragedy and believe me, it makes me sad. The founders of this great club chose this site because it was appropriate golfing land with very few trees and rolling terrain inhabited by native grasses. Somehow over time people, including myself, lost site of the importance of open space for good golf, and now the course has become overgrown with Fir trees that have shaded out the good grasses and the beautiful endangered oak trees. Well I have committed my life to understanding good golf, good turf, and the history of this Club so now I see clearly that whats left of the prairie needs to be preserved. 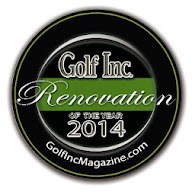 It's not too late to save the oak trees and maintain good golfing land for the future members of Tacoma C&GC. So when you see banded trees like in this picture of the area near the second tee, don't look at it as removing fir trees. Look at it as a preservation effort since that's exactly what it is. The oak trees are getting choked out and the forest is creeping in. Look at this next photo and you can see what happens when a fir tree is allowed to over top an oak tree. This big fir snapped in half in our most recent wind storm and landed on the oak next to it. In this next picture you can see the oak that was crushed. Unfortunately another endangered oak tree has been lost and this could have been so easily avoided by simply not allowing that fir tree to get that large. Look at this next picture. I took this picture near the second tee in a dense woody area where the invasive firs have been allowed to encroach. You see there is a young fir growing there that has just sprung up from seed. This is the kind of thing that we have to actively manage in order to maintain some resemblance of the prairie that used to be here. Small firs like this need to be removed before they can grow up and shade out the desirable grass and oaks. Below is another piece of evidence that proves my point. In this picture you see a young oak tree near the fairway on #2 that died this past winter. Last spring I know it was alive because I was making plans to relocate it to an open area where it would have a chance to survive. I never found time to save that oak and as you can see, it finally died a very slow death caused by shade from towering firs. Okay so now I'm sure I've lost some readers since many of you may have just gotten bored with the length of this post or your one of those that just thinks there's no reason to ever cut down a tree. Yes it's true this has turned into another one of Joel's posts about removing trees, and I know that makes a lot of people uncomfortable. Hopefully some of you see that this is about saving endangered trees and preserving whats left of what makes this land so good for golf. Please follow this link by clicking HERE and check out the website which brings awareness to the tragedy of the diminishing prairies and to those people that have committed themselves to preserving whats left of it and even reclaiming it. You'll see that there is a video on that web page. It's worth watching as it explains how the prairies got here, how they were maintained by natives, and how now they are being lost. The acreage of prairie in our area has dwindled to 3% of what it was before settlers arrived and because of that, hundreds of unique species are going to soon be extinct. We have a chance to assist in the conservation effort to save the prairies by making sure the forest is kept at bay and the oak trees are given a chance to survive. The great thing about spending time and money saving what's left of the prairie at Tacoma C&GC is that it also is good for golf. You can't grow grass in a Douglas fir forest but in an oak inhabited prairie, grasses are actually the normal coverage and so that is land perfectly suited for golf and at Tacoma C&GC, good golf should be the focus. By the way, the reference at the beginning of this post to "chasing the anise bag" goes back to the days of fox hunting which apparently was done year around during those early years. The hounds would chase the anise bag in the absence of the fox which I'm sure got increasingly more common as the fox was hunted to near extinction.